Firefighters battle a blaze at the Horizon Metals facility on the Northwest Side of Chicago. A massive fire destroyed an industrial building on Chicago’s Northwest Side Friday morning. When fire crews arrived around 4:15 a.m., the flames were through the roof of Horizon Metals. There was also a large explosion, possibly a propane tank, forcing firefighters into defensive mode. A second alarm was called about 15 minutes later, bringing more than 100 firefighters to the scene. A third alarm was called about 15 minutes after that. The roof eventually collapsed. 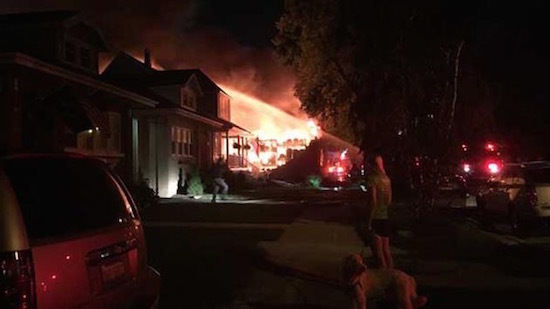 In less than an hour, however, the blaze was under control at 5:30 a.m., before the flames spread to a nearby house. It was out less than an hour later. Firefighters stayed at the scene to watch for hot spots. The building is a complete loss, authorities said. The metal plating business was closed when the fire started. No one was inside the building, officials said. A hazardous materials team was called to the scene as a precaution. Authorities later said there was no threat. One firefighter suffered back injuries while battling the blaze. He was transported to Swedish Covenant Hospital for treatment and officials say he will recover. The blaze shut down roads around the facility and public transportation ended up diverted around the site.